McClain’s Reece Schluep (15) had the lone goal for the Tigers on Tuesday against Miami Trace. 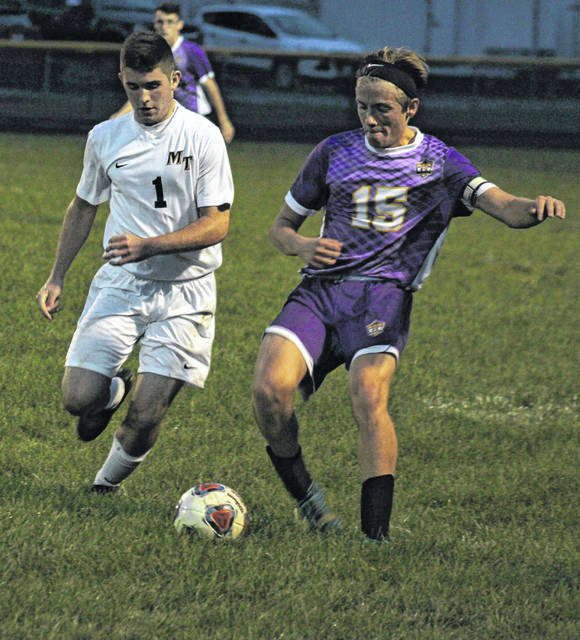 Defending is Panther Kyler Conn.
GREENFIELD — The Miami Trace Panthers had a hard-fought match against Frontier Athletic Conference opponent McClain on Tuesday, Sept. 25, but the visitors were able to escape McClain Field with a 2-1 win. Miami Trace held a 1-0 lead at the end of the first half. Kyler Conn scored for the Panthers in the 25th minute of the game. The assist went to Caleb Perry. McClain’s Reece Schluep tied the match at the 29:44 mark of the second half. With 28:23 remaining in the match, Kody Burns scored an unassisted goal for the Panthers. Miami Trace had 25 shots on goal. Justin Shoemaker had six saves for the Panthers. McClain had 12 shots on goal and their keeper, Noah Reeves, had 11 saves. “It was a great game,” McClain head coach Nick McNeal said. “The boys put it all out there. In the first half, we were a little bit shaky. In the first 25 minutes, up until Miami Trace got their goal, I felt like we kept the ball on their side of the field. I feel like we maintained possession. We had plenty of opportunities. We just didn’t get it in the back of the net. Miami Trace shutout McClain when the teams met back on Aug. 30, 6-0. Miami Trace (now 8-4-0 overall, 5-2-0 in the FAC) is at Hillsboro Thursday at 6:45 p.m.
McClain (now 3-7-0 overall, 1-6-0 in the FAC) is at Chillicothe Thursday. In other FAC matches Tuesday, Chillicothe beat Washington, 12-0. The Jackson at Hillsboro match was postponed. https://www.timesgazette.com/wp-content/uploads/sites/33/2018/09/web1_McClain-boys-soccer-vs-MT.jpgMcClain’s Reece Schluep (15) had the lone goal for the Tigers on Tuesday against Miami Trace. Defending is Panther Kyler Conn.